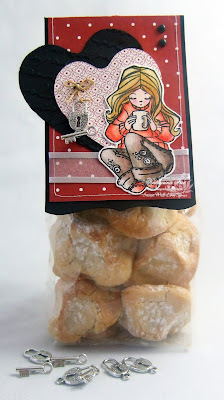 Today I want to show you this bagtopper I did for a bag of delicious amarettinis (those small cookies you eat with your coffee in italy). Heute will ich euch einen bagtopper zeigen, den ich für ein Säckchen Amarettinis gemacht habe. I used black cardstock from Stampin' up to cut the base of the bagtopper. I did the wavy border with the Spellbinders Label 1 Nestabilities. The heart shape is done with a Fiskars cutting template. I embossed the black one with the Cuttlebug "script" embossing folder. Ich habe schwarzen Cardstock von Stampin' Up für die Basis meines Bagtopper verwenedt und den geschwungenen Rand mit den Spellbinders Label 1 Nestabilities ausgestanzt. Die Herzen sind mit einem Template von Fiskars geschnitten. Das schwarze habe ich mit dem Cuttlebug embossing folder "script" geprägt. Do you want to win her? Show me your bagtopper until Jan 17th and you'' get the chance to win Willow with hot chocolate plus a bag of the heart and key charms, I used on my bagtopper. Habt ihr Lust sie zu gewinnen? Zeigt mir bis zum 17. Jänner eure Bagtopper und ihr habt die Chance Willow mit heißer Schokolade und ein Säckchen mit Charms zu gewinnen. This is the back of the bagtopper. The sentiment is printed on the computer (this little bag was an addition to the present for the wedding of my brother in law whom we gave a set of latte macchiato glasses, that's the explanation for the text :). 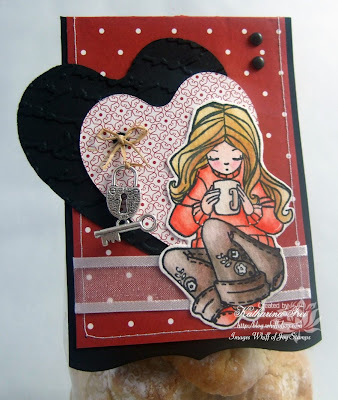 I used the hardware of the Stampin' Up hodgepodge styled silver set. Hier seht ihr die Rückseite des Bagtoppers. Der text ist am Computer generiert (das Säckchen war ein kleines zusätzliches geschenk zur Hochzeit meines Schwagers, dem wir ein Set Latte Macchiato Gläser geschenkt haben. Soviel zur Erklärung des Textes :). Ich habe die hardware des Stampin' Up hodgepodge styled silver sets verwendet. Accessories: eyelet and brads Making Memories, ribbon Raspberry ribbon, charms from stash, SU hodgepodge styled silver hardware, sewing machine, fiskars heart cutting template, Cuttelbug embossing folder "script"
Preheat oven to 150 degrees (300 F) and line baking sheets with parchment paper. In a food processor mill together the almond flour and sugar. Add the vanilla and almond extract and pulse for a few seconds. Add the eggs, one at a time, and continue to process until the dough is smooth. Place teaspoons of the dough on the parchment paper and dust with sugar. Bake for 24-30 minutes or until golden brown. Cool completely before serving. They will be slightly chewy at first, but they will be nicely crispy as a day or two goes by. Store in a cool, dry place. (Note: I usually underbake mine since I like them chewy. If that's your preference, bake them for about 20-24 minutes.) Makes about 30 cookies. ein sehr süßes Geschenk. Wunderschön geworden. Looks so delicious! Great give away. That metal frame looks so nice. Wunderschön!!! Ein sehr süsses Geschenk. So gorgeous! This makes a fabulous gift, so personal! einfach spitze wieder dein Werk!!! We give heart shaped cookies out for Valentine's Day. A bagtopper would make a fabby presentation of our goodies! Thanks for the inspiration, Katharina!! I love it ..But where is the recipe for those wonderful looking cookies ..
And I love the challenge hope I can find the time to join in! Hi Katharina, dein Bagtopper ist toll geworden. Schau mal bei mir vorbei, ich hab was schönes für dich. 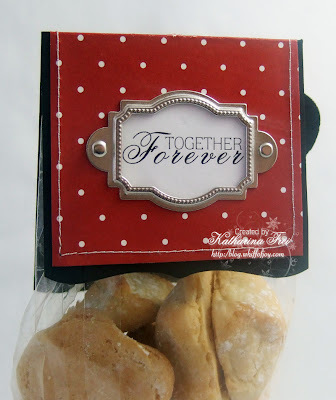 P.S thank you so much for the receipe..
Wow Katharina,Dein Bag Topper ist wunderschön! Die Gestalltung und die Farben gefällt mir alles sehr,sehr gut! This was a fun challenge, thanks. Your cookies look yummy! I've had a go at making a bag topper here. Thanks for setting this fun challenge. Here is my bag topper, I had a lot of fun making it. Thanks for the challenge! I would love to win her! Your bag topper is great. Mine is here and I'm off to make those biscuits now! Thanks for the recipe. I hope that I'm not to late, I'm down with a flu. But your challenge intrigued me - never made a bag topper before. Anyways, here it is.